This means a lot of things, Dorothy’s strong belief in the Wizard, and interesting to explore. When Dorothy was arguing with Oz, she fully believed that the being in the smoke and flames WAS some sort of higher intelligence. And she was telling It that It should keep Its word! Meanwhile, this Being has just given her an order, the command to, “Pay no attention to the man behind the curtain.” What would she do? We see two Dorothy’s in this story; the girl who first approached Oz at the beginning, and secondly, the transformed Dorothy, who has developed her own confidence. The second Dorothy is changed, and argumentative. The second Dorothy disobeyed the command of the Being, speaking from the flames, WHILE believing in its power. The Wizard of Oz was released in 1939, while the world was in turmoil. The Great Depression had suppressed and broken the American people for a decade and Hitler was preparing to invade Poland to bring on World War II. Why did Hitler invade Poland? He claimed that Poland had attacked Germany first, which would have been crazy for Poland to do, and Germany defeated Poland anyway in one day. Why Poland? Hitler believed that Germany was vulnerable to food shortages. The German soldiers literally murdered many Polish farmers, and afterwards, relocated German farmers to take over a massive farm-overhaul in the defeated Poland. Before one think this outrageous, Hitler believed in progress, and that the Americans would understand the take-over of Poland, because we had just taken-over the Indian lands in the exact same manner, genocide, in the name of human progress. Dorothy very specifically looks at her aunt and her uncle, like they were failing her. Why? Because they were playing along with Miss Gulch’s game. Everybody knew Miss Gulch was not hurt from any sort of dog bite, because we just saw her riding a bicycle. 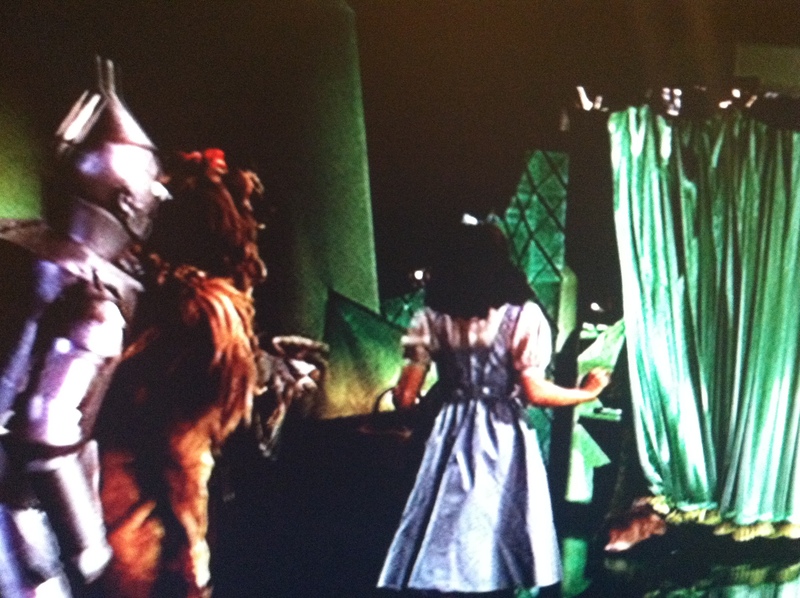 Now Dorothy is knocked unconscious, enters her inner psyche, and the “Land of Oz” represents her dream-self seeking resolve. We could say that the writers of the movie were sending a message to the American people about the nature of assumed-power (tyrants) versus the empowerment of the good-self. However, the original writer of the script HATED the final version of the film, and the movie had several directors including Victor Fleming, who was known to be proNazi. So, the movie was not prescribing the American people how to react to injustice, but was an expression of what was commonly understood, which is the timeless beauty of the film, that is, the lack of pretensions toward becoming a sermon. When Hitler invaded Poland, the film did not inform the public what Hitler was doing. The public already knew. Aunt Em, Uncle Henry, and Dorothy knew what Miss Gulch was up to, her various threats, which was why Em tried to tell her off, but couldn’t. The problem was that Em could not find her voice, had no tradition for it, while Dorothy yet had no voice. Dorothy’s whole journey into Oz was for her to find her voice, which meant that she could stand up to an “assumed” power and its game. Dorothy’s problem is that she wants to become that, as a child in Kansas, but she does not know how to react to Miss Gulch’s ploy. In fact, the three women — the witch, Dorothy, and Glinda, are a repeat of the three women in Kansas, which is, the conflict between Em, Dorothy, and Miss Gulch. The difference is that Glinda stands behind Dorothy without fear, but how does Dorothy become that herself, if her aunt cannot? That’s the question. What happens, is that Glinda sends Dorothy on a journey. Glinda knows that Dorothy wears the magical ruby slippers, so this is a mystery, that Glinda does not send Dorothy home immediately. Instead, Glinda sends Dorothy to the Wizard, because she knows that Dorothy’s weak, unconscious-self seeks RESOLVE, not a free pass back home. Glinda knows all about “the Wizard.” The Wizard represents the sinister element buried IN SOCIETY that Dorothy must seek out, and expose, and come to terms with, for herself. The evil witch is ALREADY exposed for what she is. She is easy to figure. The Wizard, however, is cloaked, and the journey, therefore, is this discovery. 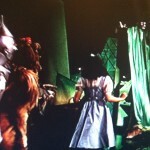 The second time Dorothy faces the Wizard, she has developed her own confidence. Now he is again barking orders and insults, and not keeping his word, and Dorothy can stand up to it. And, she has earned the right to disobey the Wizard as he says, “Pay no attention to the man behind the curtain.” How so? She has developed her own inner authority. We see this in the story of Jesus, where he defied the religious leaders of his day. He seemed to have this “inner authority.” After Jesus was gone, no big deal, the leaders said that Jesus possessed inner authority, but YOU do not, because you are not God. To say you have your own authority is called blasphemy. This is why Aunt Em could not speak against Miss Gulch, for her Christian faith, which means to subject yourself, which is a perversion of the very model of Jesus, standing-up to the religious leaders of his day by his own authority. We see this in Dorothy, as she disobeys the Wizard’s command. In that sense, by standing her ground, speaking her truth, she exposes the Wizard in his sham. There is much, much more to the magic of The Wizard of Oz, which I am forming into a little book called, “The Magic of Glinda.” The story is one of our great, original American mythologies. There are common themes across world-myth which are meant to inform, expose, and empower. Like, the Jews went to Jesus and were most concerned over “by whose authority” did he speak? This same question can be posed upon us. By whose authority do we speak? Moses? How about, the devil? Sure, we can pretend that somebody has authority over us, and give that away, like Aunt Em did. It’s a choice. We can play along, or not. S.